“When the moon hits your eyes like a big pizza pie, that’s amore” and Dino sings on and on…. When I first got married 40 years ago, pizza to me was a 50 cent box of Chef Boradee pizza mix and a 50 cent pound of hamburger meat. We, of course, didn’t have a pizza place in the town we grew in, so if you wanted pizza, you made it. The little town we lived in when we were first married had a great local place called Alex’s Pizza and to this day, I still can remember the thin crispy crust. We still made our pizzas most of the time because my husband was still in college and we didn’t eat out alot. We went to Italy a few years ago and had some of the best Italian food I have ever eaten. Also, had some of the best pizza I have ever put in my mouth. I have to tell you the story about when we were in Venice. This was our first trip to Italy and I wanted to have everything perfect. So I loaded my iPod with all kinds of music that I thought would just make the trip special. I had packed some external speakers so everyone else could enjoy the music also. We were with two other couples (one couple we would meet up with in another town a few days later). One night in Venice after going out for just one of our memorable meals, we went back to our hotel which was kind of in an alley way with a big brick courtyard. It was late at night and we set the speakers up on a fountain that was there and we were listening to the music and dancing. This was about the same time some of the local guys were getting off work for the night and they could hear the music coming from our area and decided to come see what was happening. We had one guy who had been selling roses during the day give us a rose each and a few guys interested in the ipod. But, the one thing they all knew was — “that’s Dino they said. And, he WAS singing, “When the moon hits your eyes”. I always love to tell this story. Anyway, when we returned from our trip we tried (I think successfully) to replicate a lot of our dishes like the tomato bread soup, linguine with seafood (will be posting later). I haven’t tried any pizza recipes for quite awhile but I wanted to do something not quite so traditional. This recipe I found in a little pizza book I picked up called “Pizza and Other Savory Pies” by Brigit Binns. I tweaked this recipe somewhat. To the pizza dough, I added about 1 teaspoon Italian seasoning. 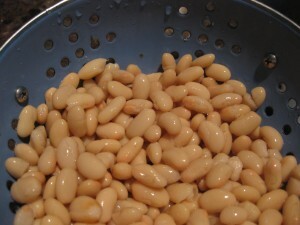 To the mashed white beans I added 1/2 teaspoon of crushed red pepper and about 1 teaspoon of lemon juice. Place a pizza stone on a rack in the lawer third of the oven and preheat to 450°. Let the pizza stone heat for 45-60 minutes. I cooked my pizza on a perforated pizza pan and another one just on a cookie sheet. Roll out the dough on parchment paper or flour dusted cutting board. (I made my pizza into individual ovals instead of doing one large pizza.) Press the dough out into the shape you desire using oil to coat your fingers. If dough starts to draw up, cover with towel and let rest or a few minutes, then continue. The thinner the crust, the more crisp it will be. Cover dough with towel and let rise for 15 minutes. 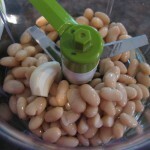 In food processor, combine the white beans, garlic, salt, pepper, crushed red pepper flakes, lemon juice and olive oil. Process until smooth and set aside. 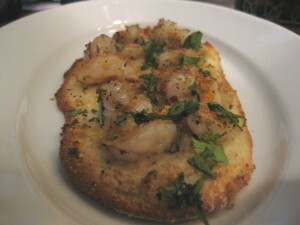 In a bowl, combine the shrimp, dried oregano, salt and pepper to taste and 2 Tbsp. olive oil. Brush the edges of the dough lightly with the olive oil. 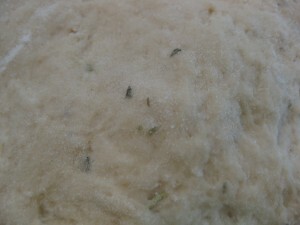 Season the dough with salt and pepper. spread the white bean puree evenly over the dough, leaving 1/2″ border uncovered. 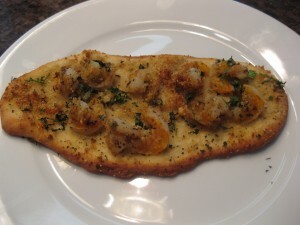 Scatter the shrimp and garlicky bread crumbs over the puree. Carefully slide the pizza topped parchment or cutting board onto the hot pizza stone (or put it on the cookie sheet). Bake until the crust is golden brown and the shrimp are pink, about 14 minutes. Remove pizza from oven and garnish with the fresh herbs, drizzle with a little olive oil and squeeze the remaining one-half lemon over the pizza. For crust: In food processor or mixing bowl with dough hook, combine the flour, whole wheat flour, yeast, sugar, salt and Italian seasoning. Pulse or mix the ingredients. 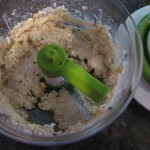 With the motor running, add the water and olive oilin a steady stream and then pulse or mix until the dough comes together in a rough mass, about 12 seconds. If the dough does not form ino a ball, sprinkle 1-2 teaspoons of water and pulse/mix again until a rough mass forms. Let the dough rest for 5-10 minutes. Process again for 25-30 seconds. The dough should be tacy to the touch but not sticky. Transfer the dough to lightly floured work surface and form it in a smooth ball. Place the dough in large oiled bowl, turn to coat with oil and cover with plastic wrap. Let the dough rise in a warm place until doubled in bulk and spongy, about 1 1/2 hours. Makes 2 balls of dough. You can freeze what you don’t need for this recipe. I love your blog! thank you for suggesting me to stop by, it’s really delicious and interesting!